Reporting Services Server cannot connect to the DPM database. 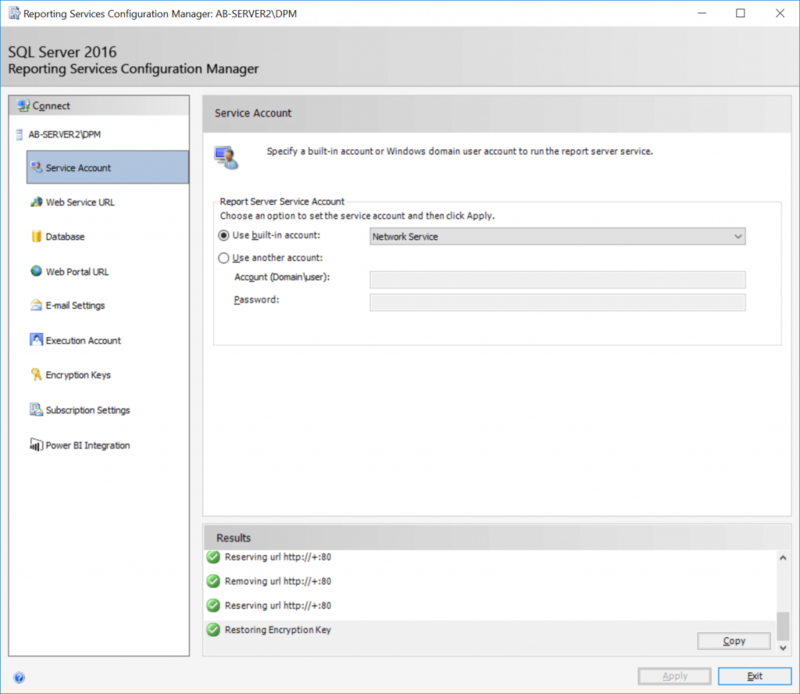 To repair the configuration, follow steps for repairing DPM from DPM Setup Help. Just an endless loading page presented in your browser. Unfortunately, following the repair steps suggested in the More Information link does not resolve the problem. Description: This group is internally used by Microsoft System Center 2016 Data Protection Manager. Description: This account is used for SQL reporting to generate reports for DPM 2016. 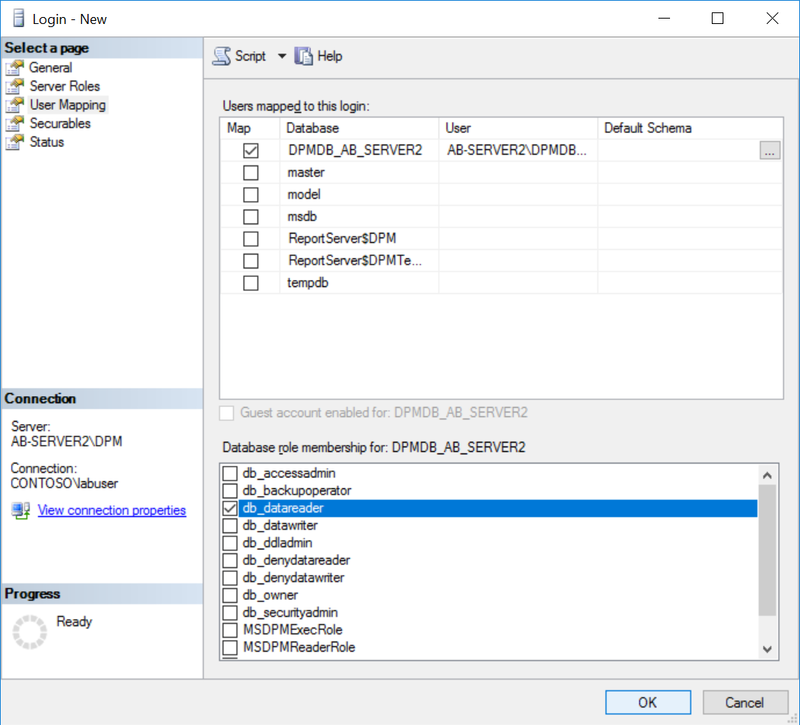 Start Microsoft SQL Server Management Studio and connect to the SQL instance used by DPM. Click on the User Mapping section, check the checkbox for YourDPMDatabase, and check the checkbox for the db_datareader role. 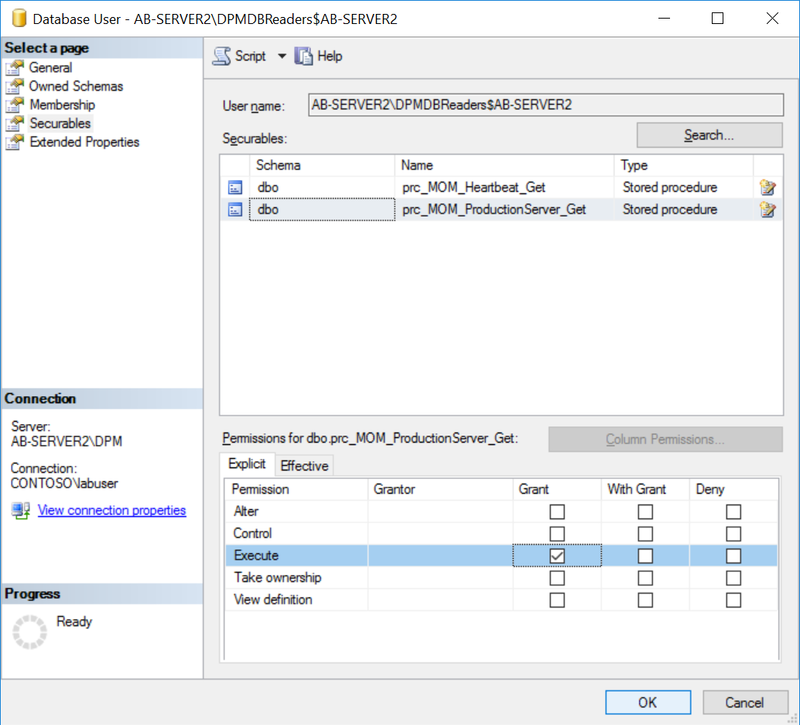 In Microsoft SQL Server Management Studio, expand Databases, expand YourDPMDatabase, expand Security, expand Users, and right click Properties on the DPMDBReaders$DPMSERVERNAME group you granted access to in step 4. Place a checkbox in the Grant column for the Execute row. Make sure you do this step for both [dbo]. [prc_MOM_Heartbeat_Get] and [dbo]. [prc_MOM_ProductionServerGet], checking the box once will only update one of the storage procedures. Exit Microsoft SQL Server Management Studio. 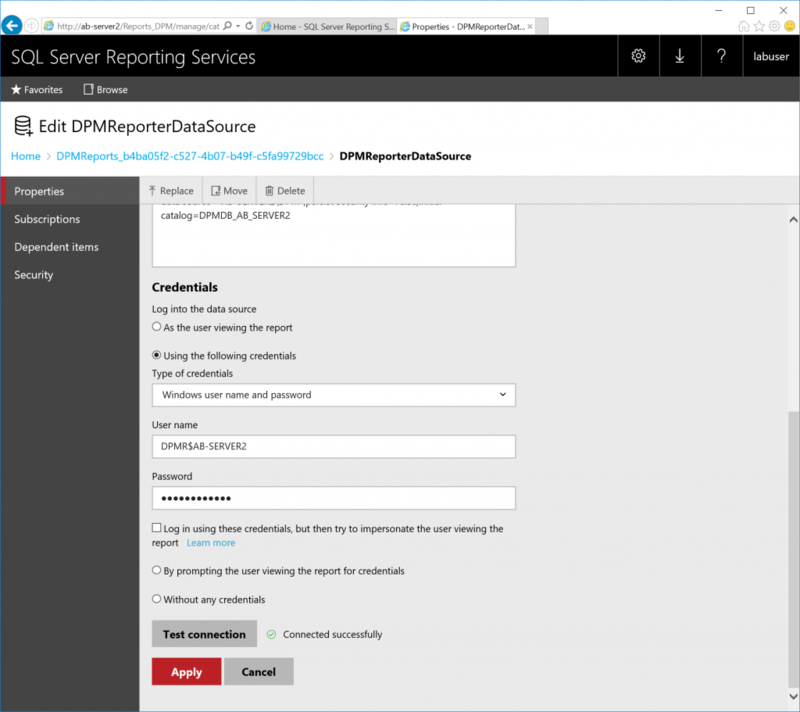 Open Reporting Services Configuration Manager and connect to the SqlServer and Instance hosting the DPM reports (as you go through this, replace the items in Red with your applicable values). Click on the Web Portal URL menu item and click on the listed URL for DPM. Click on the DPMReports_GUID folder to open the DPM reports page. Click on the DPMReporterDataSource Data Source to open its properties. You will then be prompted to specify an account with administrator privileges. Click OK to use your current account. At this point, you should now be able to schedule e-mail reports without experiencing the original error and your reports should load properly! 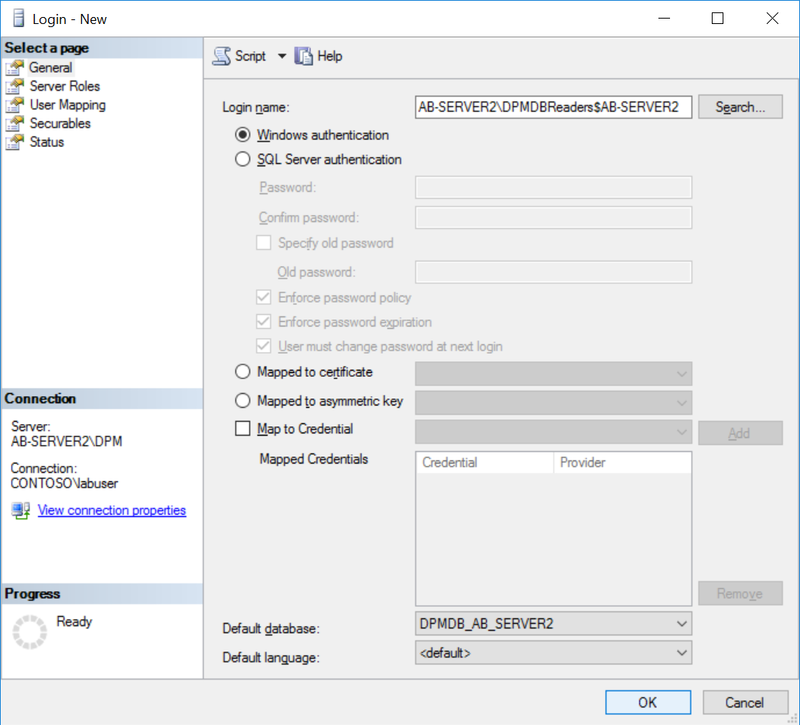 This entry was posted in Uncategorized and tagged cannot connect to DPM database, dpm 2016, error id 3001, reports not loading on March 15, 2019 by Jack.